Another movie that's so bad, it's awesome is "Space Truckers"
Dennis Hopper stars in this really cheesy scifi/comedy that includes square pigs, cyborgs, pirates and really terrible sets, costumes and special effects. A must see. You'll probably hate it and want the hour of your life back but you'll be better for seeing it.. 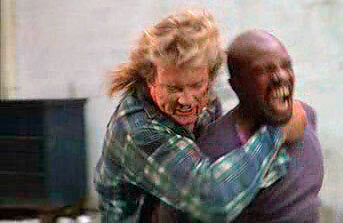 I was at someone's house when They Live's fight scene started on their TV. That pretty much ruined any hopes that I'd watch the full movie. I like "They Live", but I love "Space Truckers". I'll watch pretty much anything with Dennis Hopper in it. And yes, that includes "Waterworld". Hmmmm. I guess fake HTML tags are just ignored. Well, somebody will figure the quote out without them. Robert Z'Dar is *definitely* up there; his mere presence is a virtual guarantee of a bad movie. If you liked any of his other flicks, I highly recommend "Soultaker", which has the additional benefit of also starring Joe Estevez aka "Martin Sheen Lite" -- lite on the acting skills, of course. It was also featured on MST3K -- a must for lovers of bad movies. So, this is where the "bad movies" discussion is? I figure none is really quite complete without a mention of Tracker 3. Mostly I just browse the list and look at screenshots, which is quite enough. I was young enough not to notice or care about the production values of They Live when I saw it, but the end scene when all of a sudden everyone can see the bad guys freaked me out big time. I went out and bought They Live at your suggestion when I first read this blog post, and it was superb. Then recently I obtained Frogtown through Netflix and now I understand that not only are you a genius but you are truly a psychopath as well. Bravo, my Aussie friend. Bravo.